FLIR Thermal Imagers There are 9 products. The FLIR TG165 Imaging IR Thermometer, is a powerful, affordable, compact tool that lets you see invisible heat patterns, measure temperatures accurately, and conveniently store images and measurement data for reporting. The FLIR E4 is feature rich and extremely affordable thermal imaging camera with FLIR's patented MSX-technology. 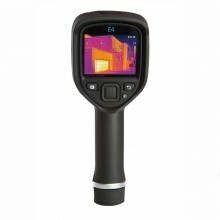 Feature rich and extremely affordable thermal imaging camera with FLIR's patented MSX-technology. Designed for entry-level users, and measuring temperatures up to +250°C, the E6 produces instant, ‘point-and-shoot’ JPEG thermal imagery with all required temperature data included.Includes: FLIR E6 Thermal Camera, Hard Transport Case, USB Cable, Power Supply/Charger and Rechargeable Battery. The FLIR E8 camera offers Picture-in-Picture that inserts the thermal image over the visible photo as an extra documentation option. The FLIR E85 has the sensitivity and resolution needed to diagnose problems and find hidden deficiencies – even from a distance. The FLIR E95 has the sensitivity and resolution needed to diagnose problems and find hidden deficiencies – even from a distance.